The Orchid Column: Coryanthes, you make me crazy. Coryanthes, you make me crazy. Coryanthes are the most difficult plants I have ever grown. Clearly they are worth the effort--a fragrance that is almost edible, a grotesque (and let's face it, slightly pervy) appearance, a clever pollination mechanism, a symbiotic relation with two species of ants. But absolutely maddening in cultivation, at least in our greenhouses. The plants grow robustly for a year or so before I start to notice the subtle signs of decline: no new shoots appear, a few leaves are shed, and finally, the entire plant is leafless. If I remove the plant from its pot the root system is dead. Coryanthes make me want to bang my head against the wall. Why? Coryanthes must be the orchid world's biggest mollusk magnets. While the adjacent pots of Phalaenopsis remain mollusk-free, it's rare to find a Coryanthes pot in any of our greenhouses that doesn't harbor at least a couple of slugs, and even worse, their minute evil cousins, the bush snails. Forget the metaldehyde, iron phosphate, beer, copper strips. It seems nothing kills these guys except the bottom of my shoe. And I have actually learned to enjoy crushing bush snails between my thumb and forefinger. So, this summer I have applied a draconian solution--removing all the organic medium surrounding the roots and attaching our Coryanthes, young and old, to slatted cedar slabs as the new roots emerge. 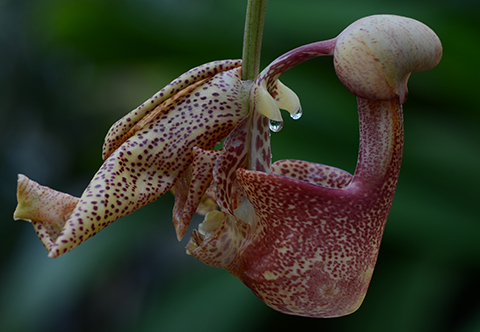 This is indeed a radical step since Coryanthes love moisture, plus it flies in the face of conventional wisdom which recommends mimicking an ant garden stuffed with acidic organic matter. But on these slabs the slugs & snails have nowhere to hide. And the mild but regular drying will make the Coryanthes a less appealing refuge for egg laying. That said, it's still a very humid greenhouse. Look at those gorgeous root tips! Completely unmolested by slugs. 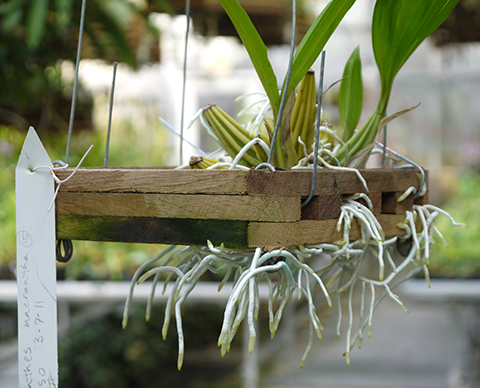 If the slabs look familiar to you it's because they are in fact simply the bottom of the classic cedar hanging basket sold by the major orchid supply houses. 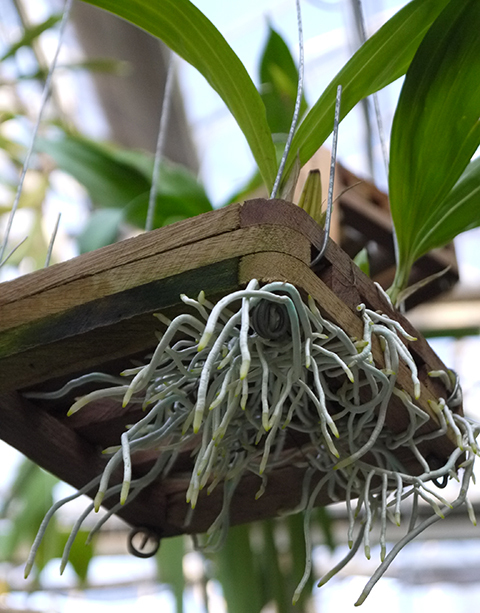 I think most people hang these slabs vertically, but I have decided to use them as rafts in order to retain a bit more moisture around the Coryanthes roots. 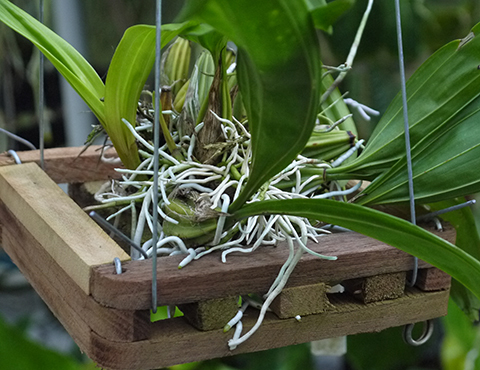 Time will tell whether or not this is a good cultural approach for Coryanthes. And how did it go with the Coryanthes?